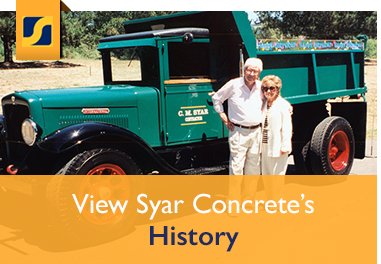 Syar Concrete LLC, a wholly owned subsidiary of Syar Industries, Inc., supplies its customers with high quality readymix concrete products through its ten readymix batch plants in strategic locations from the northern San Francisco Bay area to the Sacramento region. 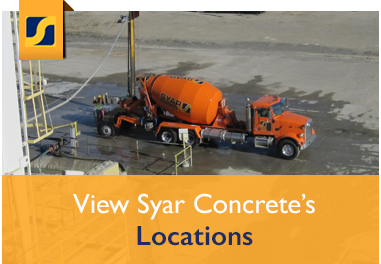 With its dedicated professionals, Syar Concrete utilizes the most modern concrete mixer truck fleet in the business, state-of-the art GPS based central dispatching, and cutting edge computerized plant controls. The company’s experienced sales, operations, and quality control staffs have the goal to provide the customer with the best construction materials available in the timeliest manner possible through outstanding customer service. 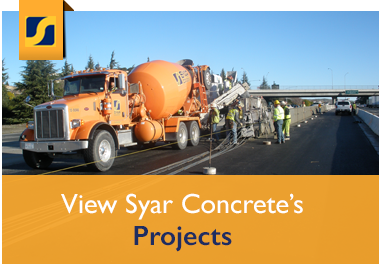 We provide product data sheets on each of our products ensuring proper use and installation on all Syar Products. Syar’s Quarterly Newsletter is full of helpful information.